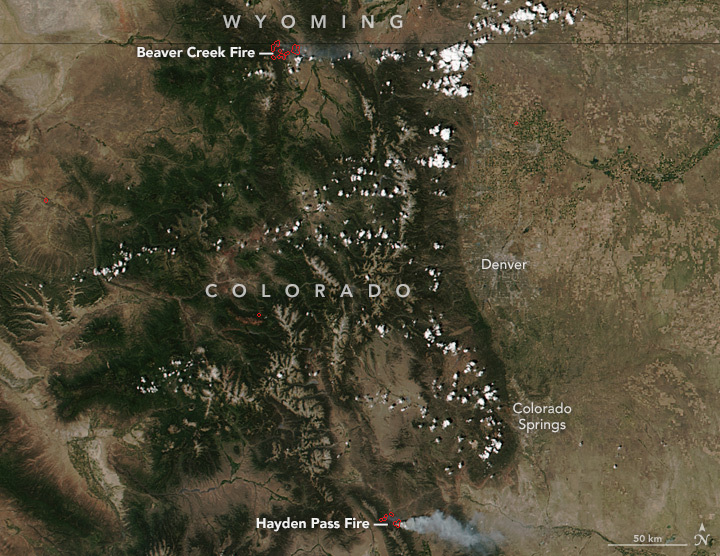 Colorado’s Beaver Creek and Hayden Pass fires continued to burn in mid-July 2016. 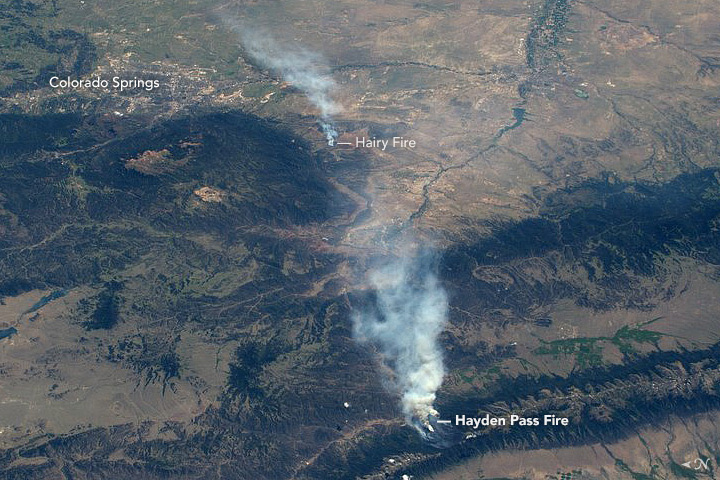 The Hayden Pass Fire, which began on July 10, has consumed nearly 13,000 acres, according to news reports. More than 450 firefighters are working to contain the blaze, and residents have been evacuated from nearby areas. 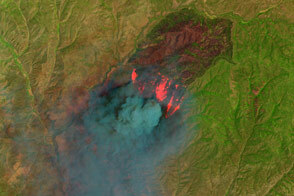 Conservationists worry that the fire could decimate populations of the Hayden Creek cutthroat trout, a protected species unique to the area. Astronaut Jeff Williams shot a photograph of that fire (top of this page) from the International Space Station on July 11, 2016. 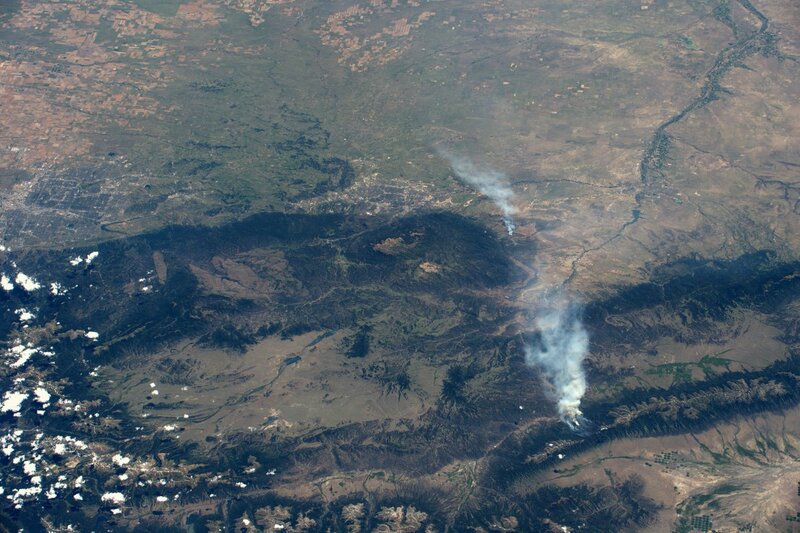 The Beaver Creek fire crossed the border into Wyoming on July 12, charring more than 20,000 acres, according to local news sources. 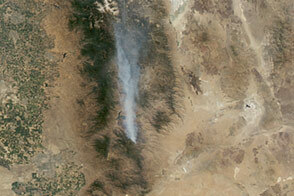 At least 230 firefighters have been battling the blaze, which started on June 19. 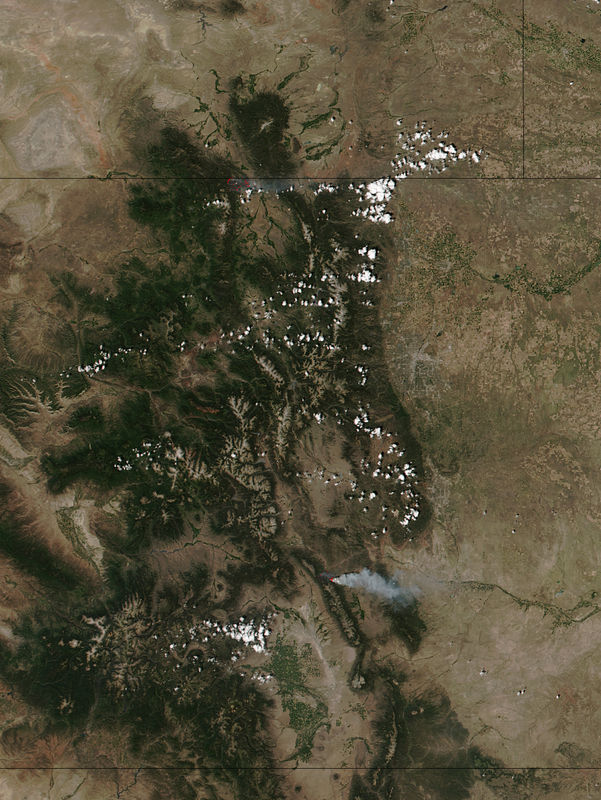 The fire is now 5 percent contained, according to The Denver Post. 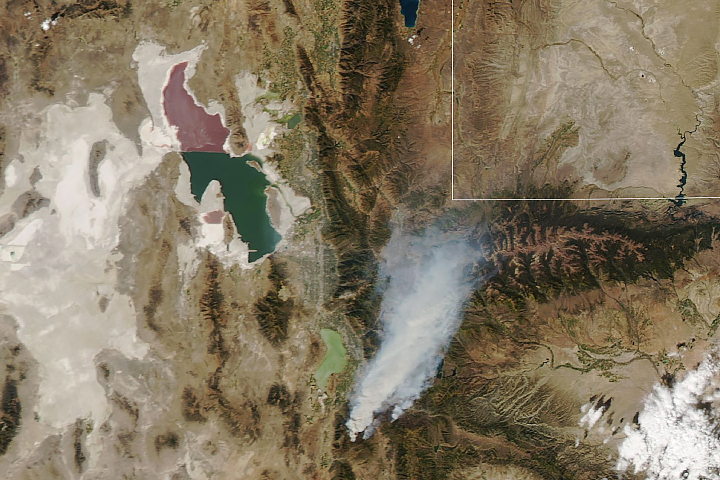 On July 13, 2016, the Visible Infrared Imaging Radiometer Suite (VIIRS) on the Suomi NPP satellite captured this image of the two fires. 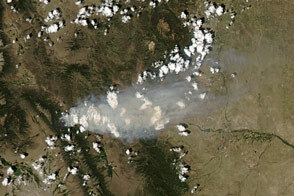 NASA image by Jeff Schmaltz, LANCE/EOSDIS Rapid Response using Suomi NPP VIIRS data. 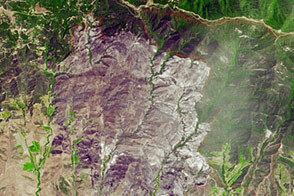 Suomi NPP is the result of a partnership between NASA, NOAA and the Department of Defense. ISS photography by Jeff Williams. Caption by Pola Lem. 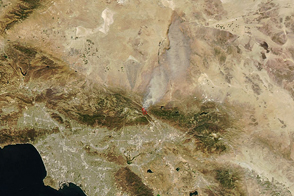 Seasonal drying and long-term drought set the stage for summer wildfires to burn throughout the southwestern United States. The Christian Science Monitor (2016, July 14) One-of-a-kind Trout Feared Exinct in Hayden Pass Fire. Accessed July 14, 2016. The Denver Post (2016, July 13) Stubborn and Slow-Moving Beaver Creek Fire Continues to Grow Slightly. Accessed July 14, 2016. 9 News (2016, July 14) Hayden Pass Fire Prompts New Evacuations. Accessed July 14, 2016.